Kawasaki Heavy Industries, Ltd. is an international corporation based in Japan. 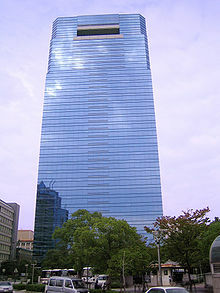 It has headquarters in both, Kobe and Minato, Tokyo. The company is named after its founder Shozo Kawasaki and has no connection with the city of Kawasaki, Kanagawa. Even though it originally started out as a ship-building company, its most visible consumer product lines are its motorcycles and all-terrain vehicles, although the company and its subsidiaries also manufacture personal water craft, ships, industrial plants, tractors, trains, small engines, and aerospace equipment (including military aircraft). Subcontract work on jet aircraft (including jumbo jets) has been done for Boeing, Embraer, and Bombardier. Picture - Japanese Experiment Module "Kibō"
Kawasaki is active in a diverse range of the aerospace industry. The Company is a contractor for the Japanese Ministry of Defense and has built aircraft such as the T-4 intermediate jet trainer and the P-3C antisubmarine warfare patrol airplane. It is currently developing two large, next-generation aircraft, the XP-1 maritime patrol airplane and the C-X transport aircraft. Kawasaki also builds helicopters, including the BK117, jointly developed and manufactured with Eurocopter. It also produces the CH-47J / JA helicopter. In the commercial aviation business, the company is involved in the joint international development and production of large passenger aircraft. It is involved in joint development and production of the Boeing 767, Boeing 777 and Boeing 787 with The Boeing Company, and the 170, 175, 190 and 195 jets with Empresa Brasileira de Aeronx�utica. It is also involved in the joint international development and production of turbofan engines for passenger aircraft such as the V2500, the RB211/Trent, the PW4000 and the CF34. Kawasaki also work for the Japan Aerospace Exploration Agency. The Company was responsible for the development and production of the payload fairings, payload attach fittings (PAF) and the construction of the launch complex for the H-II rocket. It continues to provide services for the H-IIA rocket. Picture - A train of Kawasaki MARC III bi-levels at BWI Rail Station on the Penn Line headed towards Baltimore. Kawasaki Shipbuilding Corporation is a wholly-owned subsidiary of Kawasaki Heavy Industries. Its product range include high-performance LNG and LPG carriers, container ships, bulk carriers and VLCCs, as well as submarines. The Company is also involved in the development of offshore structures and research vessels. Kawasaki Heavy Industries Pictures and Kawasaki Heavy Industries for Sale.